If you’re considering retiring to a manufactured home community near Tampa, be sure to check out the affordable Florida lifestyle offered at StrawBerry Ridge. Located just minutes from Downtown Tampa, our 55+ community offers plentiful opportunities to live a robust, active lifestyle, as well as easy access to an incredible array of area attractions. Whether you’re thinking of your own needs, or planning ahead for winter visits from the grandchildren, StrawBerry Ridge is the community for you. Our residents also enjoy games of pickleball, billiards, cards, dances, and other social activities designed to bring everyone together. Here, neighbors come to see one another as family, and strengthen those bonds during our many activities together. The friendships you develop at StrawBerry Ridge will truly last a lifetime. In addition, every manufactured home in our community is clean, updated, and ready for occupancy. Many of these homes have been refurbished by expert craftsmen inside and out, with updated vinyl siding and windows, new countertops and cabinets, and more. You can rest easy knowing that your days of laboring through home maintenance chores are now behind you. After all, with major attractions like theme parks, aquariums, and beaches nearby, who wants to spend the day doing home repairs? 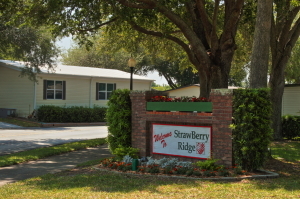 Contact one of our friendly Lifestyle Consultants today to learn more about StrawBerry Ridge and why our manufactured home community has been such a popular choice for those retiring to the greater Tampa, FL, area.